1Materials Sciences Division and the Molecular Foundry, Lawrence Berkeley National Laboratory, Berkeley, California, USA. 2Fundamental and Computational Sciences Directorate, Pacific Northwest National Laboratory, Richland, Washington, USA. The use of biomolecular scaffolds to direct the organization of inorganic or organic nanomaterials addresses the grand challenge of assembling multiple functional units with precise control over their spatial arrangement at the molecular level [1-3]. Biomolecules, such as peptides, proteins, and nucleic acids have all been used as building blocks for bottom-up assembly of intricate structures thanks to their inherent chemical and biological addressability, structural precision, and efficiency of synthesis . In photosynthetic bacteria, light-harvesting units are organized with molecular-level precision around the photochemical units [5-6]. In this way, they generate antenna complexes that ensure efficient photon absorption and energy transfer. In a similar way, biomimetic assembly of plasmonic nanostructures can provide molecular-level spatial precision, creating potential improvements in efficiency of light-harvesting platforms, light-emitting devices, and optical sensors [7-8]. 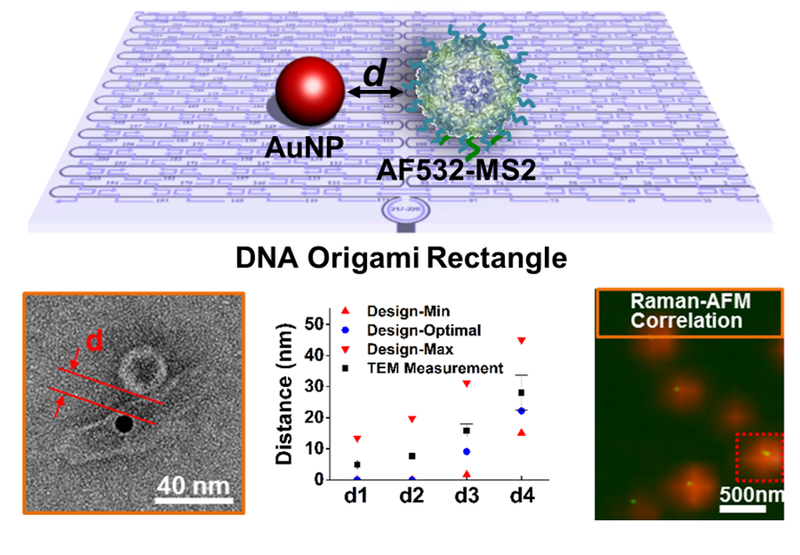 Recently, we reported the bottom-up assembly of hierarchical plasmonic nanostructures using DNA origami tiles and MS2 virus capsids . These bio-inspired structures serve as programmable scaffolds that provide molecular level control over the distribution of fluorescent dye molecules and nanometer-scale control over their distance from a gold nanoparticle antenna (Fig. 1). While previous studies on DNA origami assembly of plasmonic nanostructures focused on the distance-dependent response of single fluorescent dye molecules [10-11], these hybrid structures allowed us to investigate the plasmonic response of an entire ensemble of fluorescent molecules. Figure 1. Bio-inspired assembly of plasmonic nanostructures using DNA origami and MS2 virus capsids. TEM imaging and profile analysis confirmed tight control over the distance between fluorophore labelled virus capsids and gold nanoparticle antennae. Correlated Raman-AFM imaging provided direct single-particle measurements of fluorescence intensities. Adapted with permission from ACS Nano 2014, 8, 7896-7904. Copyright 2014 American Chemical Society. We studied the collective plasmon-coupled response of fluorophore-labeled capsids to the presence of an AuNP as a function of their separation distance. We demonstrated tight control over this distance by exploiting the programmable nature of DNA origami templates and the ability to site-specifically modify MS2 virus capsids (Fig.1). Using finite-difference time-domain (FDTD) numerical simulations in conjunction with atomic force microscopy (AFM) and correlated scanning confocal fluorescence microscopy, we then showed that the utilizing a 3D ensemble of dye molecules can effectively suppress the fluorescence quenching in the single molecule quenching regime, presumably due to the size effect of the capsid scaffold (Fig. 1). FDTD simulations also showed that increasing the size of the AuNPs to be commensurate with that of the capsids optimizes the fluorescence enhancement (Fig.2). Figure 2. Finite-difference-time-domain (FDTD) numerical simulations predict the plasmon-coupled response of the bio-inspired nanostructures. Adapted with permission from ACS Nano 2014, 8, 7896-7904. Copyright 2014 American Chemical Society. Looking forward, we plan to use this bio-inspired light harvesting platform to explore the effect of variations in nanoparticle size, choice of fluorophore, arrangement of fluorophores, and even the capsid shape on device performance. More generally, our assembly strategy establishes the possibility of using biological scaffolds to build hierarchical plasmonic nanostructures to address the need for energy harvesting in solar energy applications. Trevor Douglas, Mark Young, "Viruses: Making Friends with Old Foes". Science, 312, 873-875 (2006). Abstract. James J. Storhoff, Chad A. Mirkin, "Programmed Materials Synthesis with DNA". Chemical Reviews, 99, 1849-1862 (1999). Abstract. Andre V. Pinheiro, Dongran Han, William M. Shih, Hao Yan, "Challenges and Opportunities for Structural DNA Nanotechnology". Nature Nanotechnology, 6, 763-772 (2011). Abstract. Shuguang Zhang, "Fabrication of Novel Biomaterials through Molecular Self-Assembly". Nature Biotechnology, 21, 1171-1178 (2003). Abstract. Svetlana Bahatyrova, Raoul N. Frese, C. Alistair Siebert, John D. Olsen, Kees O. van der Werf, Rienk van Grondelle, Robert A. Niederman, Per A. Bullough, Cees Otto, C. Neil Hunter, "The Native Architecture of a Photosynthetic Membrane". Nature, 430, 1058-1062 (2004). Abstract. Pascal Anger, Palash Bharadwaj, Lukas Novotny, "Enhancement and Quenching of Single-Molecule Fluorescence". Physical Review Letters, 96, 113002 (2006). Abstract. Stephan Link, Mostafa A. El-Sayed, "Size and Temperature Dependence of the Plasmon Absorption of Colloidal Gold Nanoparticles". Journal of Physical Chemistry B, 103, 4212-4217 (1999). Abstract. Joanna Malicka, Ignacy Gryczynski, Zygmunt Gryczynski, Joseph R Lakowicz, "Effects of Fluorophore-to-Silver Distance on The Emission of Cyanine-Dye-Labeled Oligonucleotides". Analytical Biochemistry, 315, 57-66 (2003). Abstract. 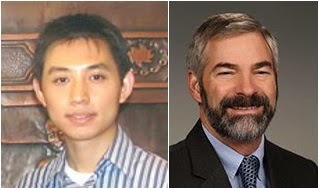 Debin Wang, Stacy L. Capehart, Suchetan Pal, Minghui Liu, Lei Zhang, P. James Schuck, Yan Liu, Hao Yan, Matthew B. Francis, James J. De Yoreo, "Hierarchical Assembly of Plasmonic Nanostructures Using Virus Capsid Scaffolds on DNA Origami Templates". ACS Nano, 8, 7896-7904 (2014). Abstract. G. P. Acuna, F. M. Möller, P. Holzmeister, S. Beater, B. Lalkens, P. Tinnefeld, "Fluorescence Enhancement at Docking Sites of DNA-Directed Self-Assembled Nanoantennas". Science, 338, 506-510 (2012). Abstract. 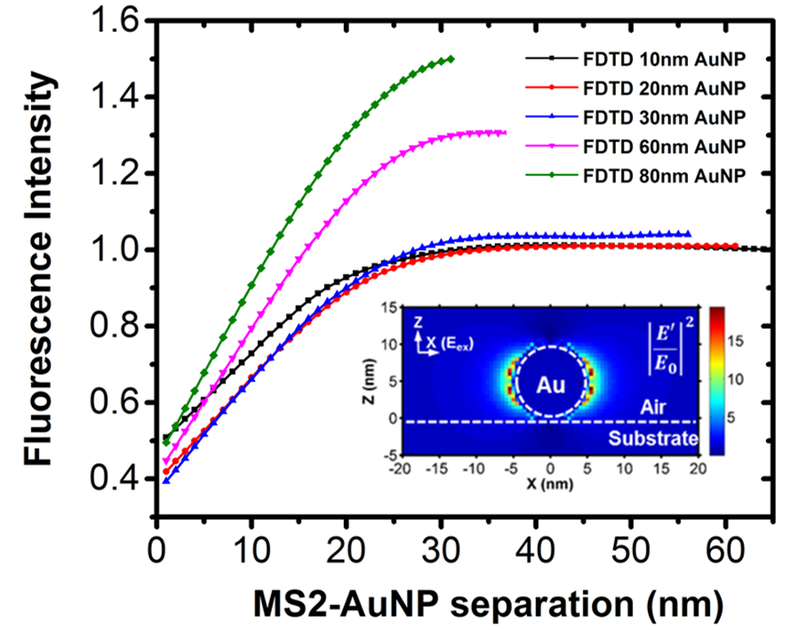 Guillermo P. Acuna, Martina Bucher, Ingo H. Stein, Christian Steinhauer, Anton Kuzyk, Phil Holzmeister, Robert Schreiber, Alexander Moroz, Fernando D. Stefani, Tim Liedl, Friedrich C. Simmel, Philip Tinnefeld, "Distance Dependence of Single-Fluorophore Quenching by Gold Nanoparticles Studied on DNA Origami". ACS Nano, 6, 3189-3195 (2012). Abstract.